In the hallway of my parents' home, there is this framed picture of four generations. My great-grandmother is at the top, my grandmother and mother side by side in the middle, and me, as a seven year old, at the bottom. 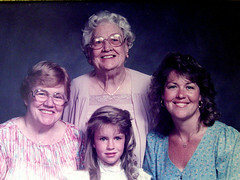 I remember the day the picture was taken, I was pissed because I'd been forced to curl my hair and wear a dress. My smile is forced and small, the uniqueness of the situation lost on me. I thought everyone had grandmas and great-grandmas. I just wanted to go play outside. My great-grandmother was born in 1900, an impossibly long ago year to a seven year old. She lived with us from when I was two until the age of nine, when she suffered a stroke that put her medical needs out of reach for my family and she had to move into an assisted living facility. I can't believe she only lived with us for seven years...it really feels like she was always there. I was eleven when she passed away, and that's when I learned more about her. She'd married my great-grandfather in 1921, had a son the next year and my grandmother in 1924. Six months after my grandma was born, my great-grandfather died, and my great-grandmother had to raise two babies all on her own. My great-uncle had health issues that the doctors said would be cured with warm, dry air, so my great-grandmother packed her two tiny kids into a car, and drove from Ohio to California alone. She didn't know a soul in California. Eventually, members of her family followed her out, but even as a kid I remember being impressed by this. She never remarried. According to my mom, she had many suitors, but her heart belonged to her husband. I wear her wedding band as my own, and sometimes I pull it off my finger and look at the inscription, "T.P.C. to M.M.O. 8-30-21." My grandmother had hardships, too. She had five children in five years (shudder! ), and unfortunately lost one of them to leukemia when he was very young. She raised her other four children on her own (with a little help from my great-grandmother), worked full-time, and still made dinner every night. She lived with us when I was growing up, and taught me how to cook and bake. She was the best listener and was always available to take me to one of my many lessons or practices. When I got older, she let me borrow her car when I couldn't bear the embarrassment of being dropped off by an adult. She always put her family first, and now that I have my own family, I see the sacrifices she made and I'm blown away. Coming from such an illustrious line of Grandmas, my own mom has some big shoes to fill. She's already been an amazing mom. She was ecstatic when Mike and I told her we were pregnant. When we were told I was going to miscarry, she put her own sadness aside to comfort us. During my prison sentence, I MEAN bed rest, she made the hour drive every other day to give Mike and I emotional support. She'd also walk the dog, clean the house, and make us dinner. She'd help me choke down the nasty hospital food that was enriched with protein and fat (gotta get those 2,500 calories! ), and when I was diagnosed with The Diabetes, she would spend hours in the grocery store looking for snacks that would be allowed on my new diet. When Madeline was born, my mom put her life on hold and stayed with us for two weeks. I needed a lot of attention as I recovered from my c-section and bed rest. She also took care of Mike during those first two terrible weeks, when we never knew what news a ringing phone would bring. The last two times Maddie has been hospitalized, we never would have been able to get through it without my mom. She stayed in the hospital with us when it was allowed, and when it wasn't she'd arrive in Maddie's room at 6 am to relieve me or Mike. She goes on doctor visits and is one of Maddie's fiercest advocates. She's also one of Maddie's favorite people - when my mom walks into the room, Madeline smiles so big I think her face will crack. With three amazing examples of mothering, I am actually the one with big shoes to fill. Some might be daunted, but I am up to the task. I want to be the best mother ever to this teeny little person. I want to make my mom and my grandmothers proud of me, that all the things they did for me really DID matter. I hope that all their hard work will be reflected in Madeline, and that she'll grow into the incredible person we want her to be. Happy Mother's Day, Mommy. I love you. Happy first Mother's Day Heather! Enjoy your sweet baby and a wonderful day. My great grandmother is still around. My grandmother, unfortunatly- passed last year of cancer... but its still beautiful to know where u came from. This was such a testament to all the women in your life - and I loved reading it.. it made me so happy and I'm trying not to cry reading about your Great-Grandmother - I love that you wear her wedding band. She sounds like the best example for any woman to follow. This will be so wonderful for Maddie to read someday - you are the best Mommy. Happy Mother's Day to you.. and all the women in your life. I'm so glad I stumbled on your blog - I feel blessed to be a small part of your big world. Wow, that was such a great way to honor your mom and her line of great moms. You are really lucky to have had that kind of support! That was a fabulous story! Thanks so much for sharing!